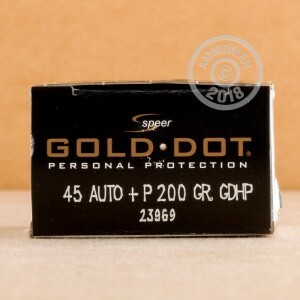 As the leader of self-defense ammunition used by law enforcement in the US, Speer Gold Dot delivers reliability, high performance, and trust in their Personal Protection line. Each hollow point bullet goes through an extensive bonding process so that each jacket literally bonds with its core, drastically reducing jacket/core seperation, and increasing terminal performance. This 45 ACP cartridge fires a 200 grain +P bullet at a muzzle velocity of roughly 1,080 feet per second. Speer is a member of one of the leading global designers, Vista Outdoor. It operates in both Shooting Sports and Outdoor Products, with high-quality, innovative products in leading retailers throughout the US and all over the world. 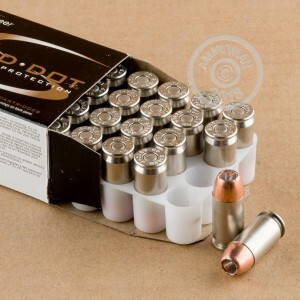 This box of 20 rounds contains boxer-primed, non-corrosive, brass cased ammunition.